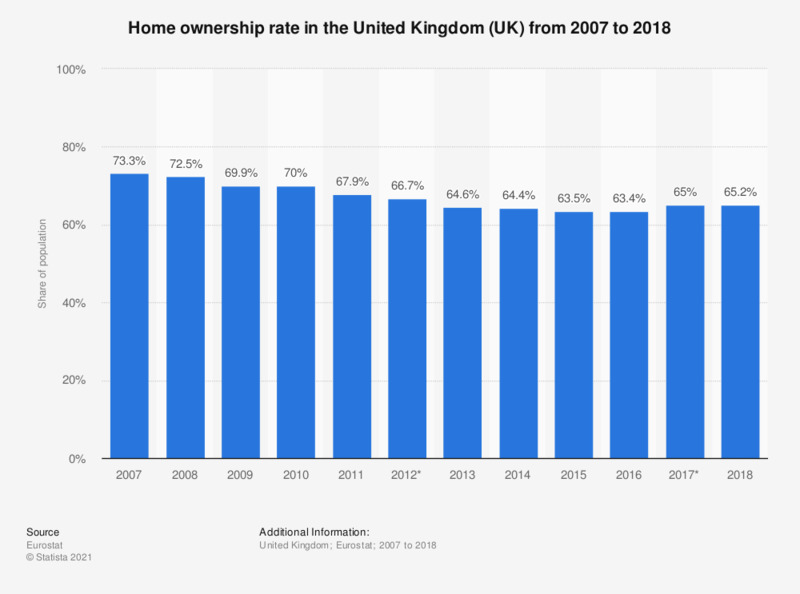 This statistic illustrates the home ownership rate among the total population of the United Kingdom (UK) between 2007 and 2016. During that timeframe, the home ownership rate oscillated between approximately 63 to 73 percent of the total population. The source adds the following information: "The collection "Living conditions" hosts indicators relating to characteristics and living conditions of households, characteristics of the population according to different breakdowns, health and labor conditions, housing conditions as well as childcare related indicators." Data coverage corresponds to code ilc_lvho02 of the EU-SILC survey. Everything On "Mortgage market in Western European countries" in One Document: Edited and Divided into Handy Chapters. Including Detailed References. Statistics on "Home purchasing in the United Kingdom (UK)"